If Sun City residents have their way, Anthem east-siders will see water rates increase dramatically next year and stay high into perpetuity. And so far, Sun City is winning the battle of resident input. Anthem Community Council wants that to change. The Arizona Corporation Commission is in the midst of a lengthy process weighing two options for EPCOR’s water rate structure. Consolidation of all 11 of the utility’s geographically dispersed Arizona districts would mean all customers pay the same rates. Stand-alone rates would keep districts separate. Either way, EPCOR is seeking more funds overall to address what it calls necessary maintenance, and to make capital investments to sustain long-term operations. Sun City residents are lobbying hard for stand-alone approach, which would keep their rates significantly lower than under consolidation. 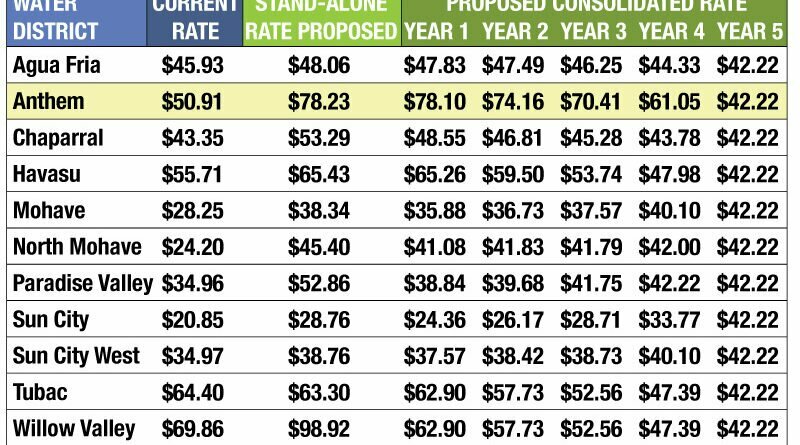 Anthem Community Council is emphatically in favor of consolidation, which in the long run would mean a monthly rate of $42.22 for a typical Anthem customer vs. $78.23 under the stand-alone scenario (see chart below). The stand-alone rate would represent a 127 percent increase for Anthem customers since 2008, vs. a 22 percent increase in the Consumer Price Index during that time, according to an analysis by council staff. Sun City has submitted to the Corporation Commission 7,700 signatures on a petition opposing consolidation, Willis said at the July 25 monthly board meeting. Anthem has submitted fewer than 500 letters and emails, as of last count, according to council staff. EPCOR serves 8,732 ratepayers in Anthem. Note that the rates discussed in this article are basic water rates only, and do not include wastewater rates or other fees that make up an EPCOR bill, and the rates cited are examples for typical customers only. To express views, residents can visit the Arizona Corporation Commission’s public comment page. Type “EPCOR Water Arizona Inc” for the Company Name. The eDocket number is WS-01303A-17-0257. Anthem Community Council recommends residents be “for” consolidation. “In the space provided, please share with the Commission how you feel about your water rates, and that Anthem shouldn’t have to continue to shoulder these higher rates,” the council said in a statement. Editor’s Note: The following detail was provided in a previous North Phoenix News article about the rate case and is republished here. Anthem water rates have not changed in more than nine years, EPCOR says, while the utility’s operational costs have risen and various systems need new capital investment. Consolidation would make the utility more efficient and spread the growing cost burden more equally among large and small districts, it says. In all, EPCOR is looking to generate an additional $14 million per year over the next five years — for a total of $70 million — to deal with increased operating costs and capital expenditures. “Anthem customers will benefit from consolidation,” said EPCOR spokesperson Rebecca Stenholm. That’s true in relation to the proposed cost increases for other districts, and it’s true in the long run (from the fifth year onward). But the consolidation proposal would mean an additional costs for Anthem customers during the five-year phase-in period. EPCOR’s proposal also seeks a surcharge known as a System Improvement Benefit (SIB) that would help cover expected future costs of replacing pipelines, valves, meters and hydrants. The request is for a 45-cent monthly charge per customer in the first year, to rise incrementally in subsequent years. The idea, EPCOR says, it to avoid more significant, sudden rate hikes down the road. The proposal is separate from EPCOR’s consolidation of five wastewater districts, a plan that was approved by the Corporation Commission in June 2017. In that merging of wastewater service areas, the utility said the average Anthem customer’s wastewater portion of the bill would drop by about 35 percent. The new water-district consolidation proposal was requested by the state’s Corporation Commission. The Corporation Commission will hear the case in May 2018 and will ultimately determine whether EPCOR should consolidate water districts or continue operating them independently, and what the rates will be. 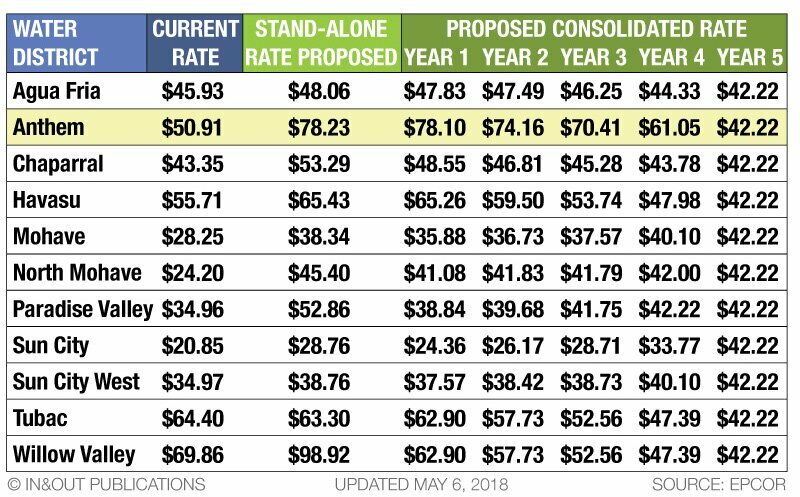 If settled on the expected timeline, the new rates could go into effect in late 2018. “The rates that are proposed are not final,” Stenholm said. Anthem water rates have not changed in nine years based on an analysis of 2008 rates, Stenholm said, and other EPCOR districts’ last rate changes range from four to 22 years ago. 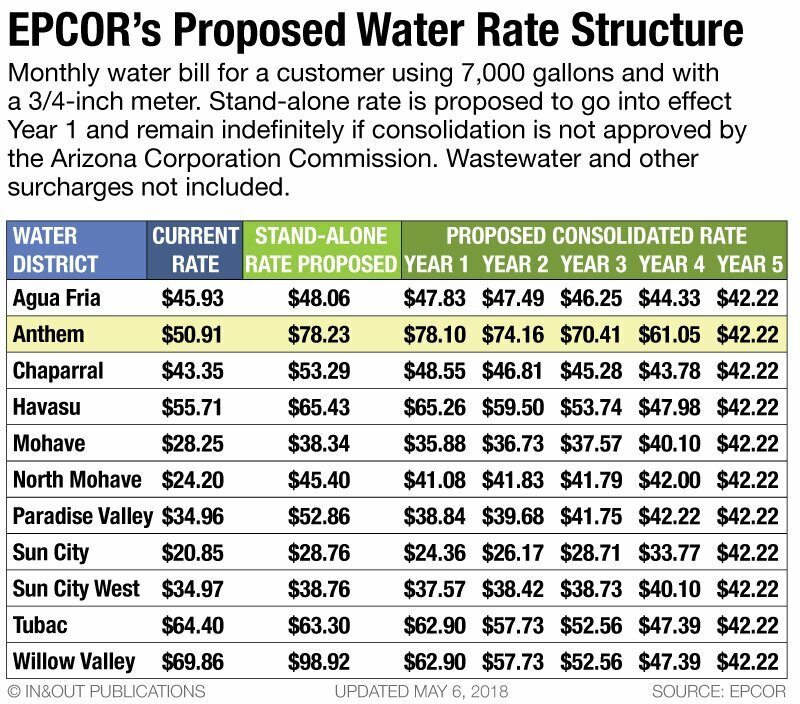 The proposed rate structure would have all Arizona EPCOR customers paying the same rate for water after five years, even though true costs of serving customers in each district vary widely. Stenholm explained: A smaller district, like Willow Valley, is very expensive to operate on a per-customer basis, given that it has many of the same infrastructure costs as a larger district. Under this logic, Anthem’s 9,000 customers would benefit in the proposal compared to the 30,000 customers in Sun City. The proposed rates are based on increasing operating costs, including increased maintenance costs on aging equipment and things as diverse as higher electricity prices and the rising cost of chemicals used to treat water. EPCOR’s proposal also asks for approval to provide assistance programs for low-income residents and disabled veterans.